These elements are available with the Switch Core Engine and you can find more details in the manual on this page. 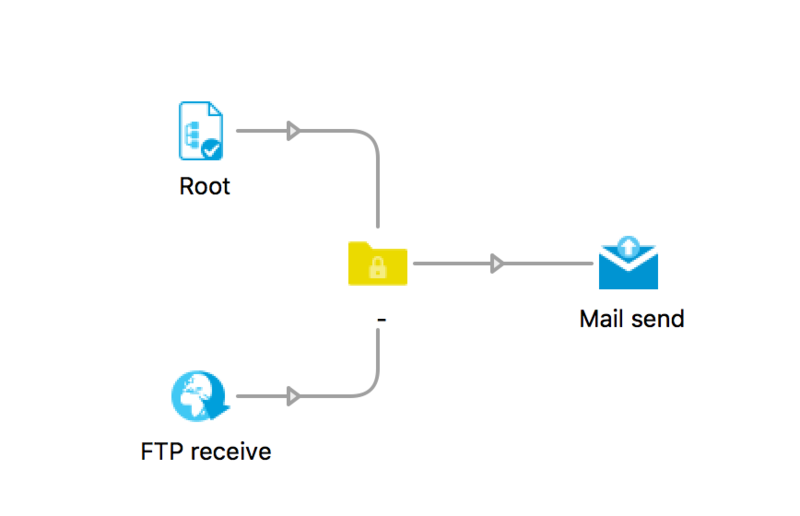 With the “Attach email info” property on the “Root” and “FTP Receive” elements you can make sure that an email address (or multiple addresses) and email body content is added to the job ticket. If a file is dropped in Customer A folder then we make sure that Customer A’s email address is linked to the job or/and some specific email body text. The same goes for the other customers’ folders. If you have Product types instead of Customers, you can also use this property to link an email address and/or email body text. 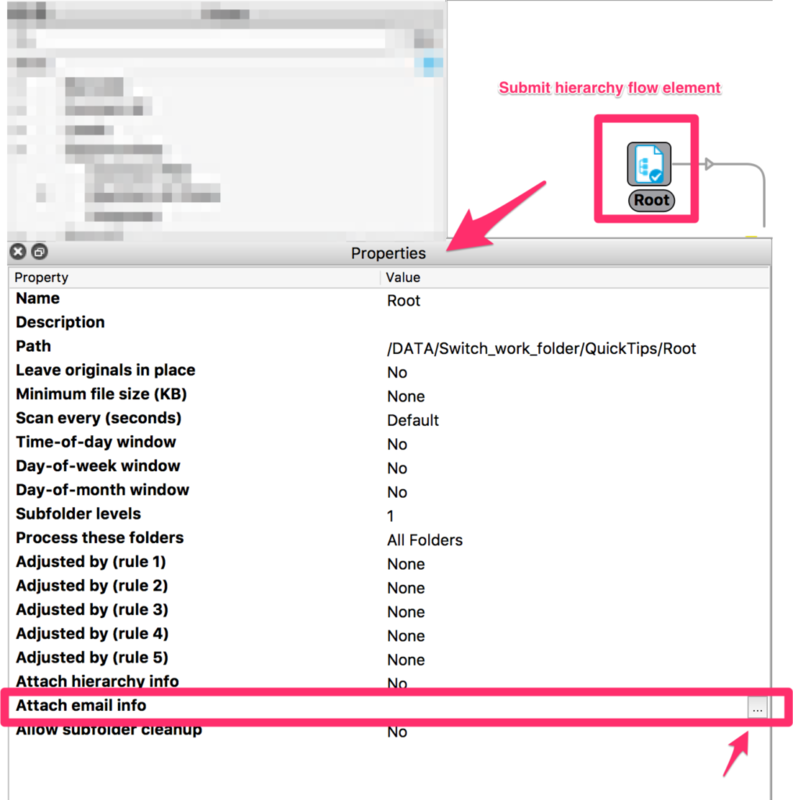 Go to the submit hierarchy flow element. 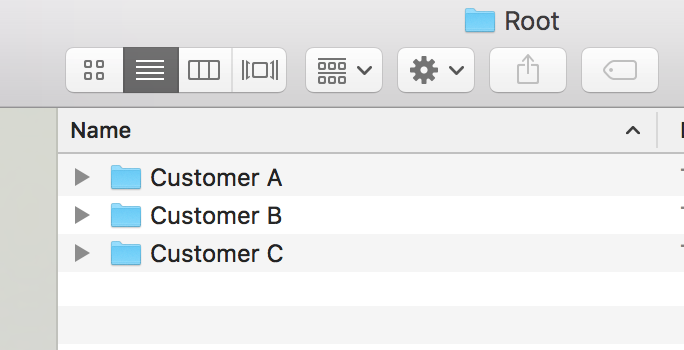 For the “Path” property, browse to your Root folder, which is one level higher than where your customer folders are located. For the “Attach email info” property, click on the button with the 3 dots on the right hand side. In the next panel, configure the details. Repeat the steps for all your folders. There are no limitations on how many folders you configure. 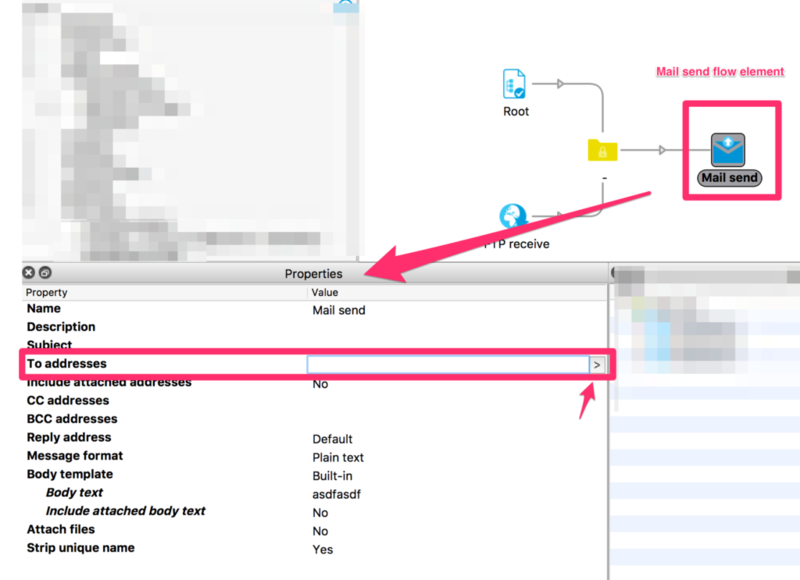 Once you have configured the “Attach email info” property, you need to configure the “Mail send” flow element. Click on the button with the “>” symbol. 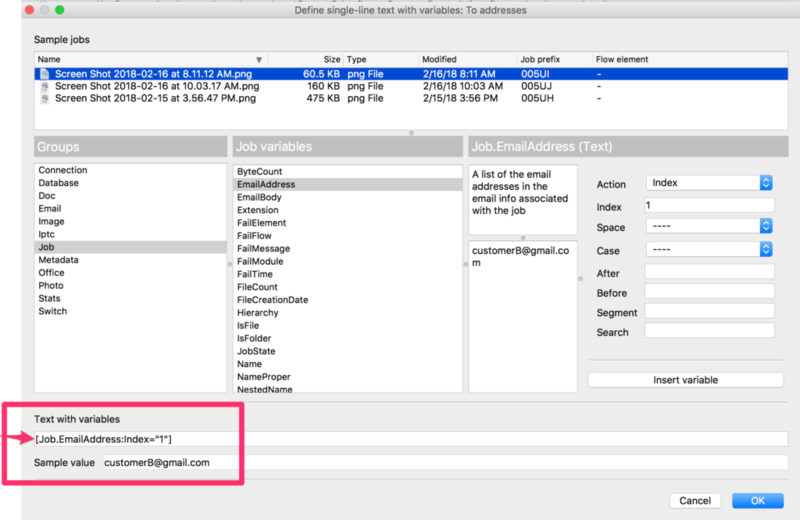 Select “Define single-line text with variables” to define the Switch job variable. Select the variable as seen in the below screenshot. 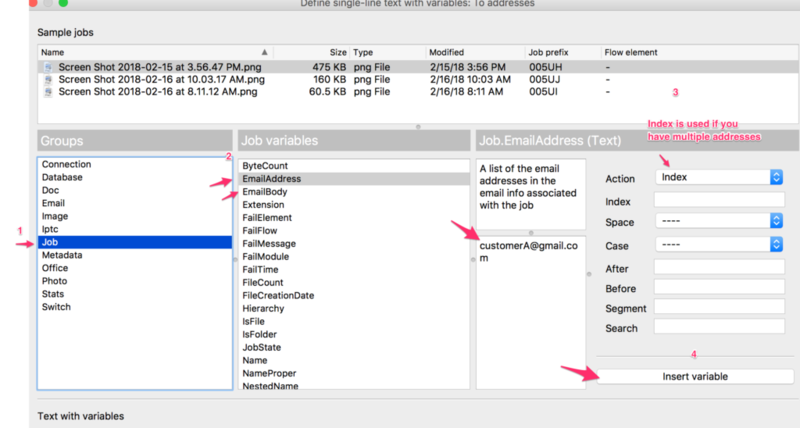 Note that in the second column you have the EmailAddress or EmailBody variable. Simply select the correct variable accordingly. You will also see an “Action” option on the right hand side with an Index option. This would be used if you have multiple addresses and you want to specify a certain one in the list. You will see the following once you click on “Insert variable”. You will also see a sample value if you have an active job in your flow. If you are not certain on how to get an active job in your flow then please go to this article and search for “Creating an active job in Enfocus Switch” in that article. 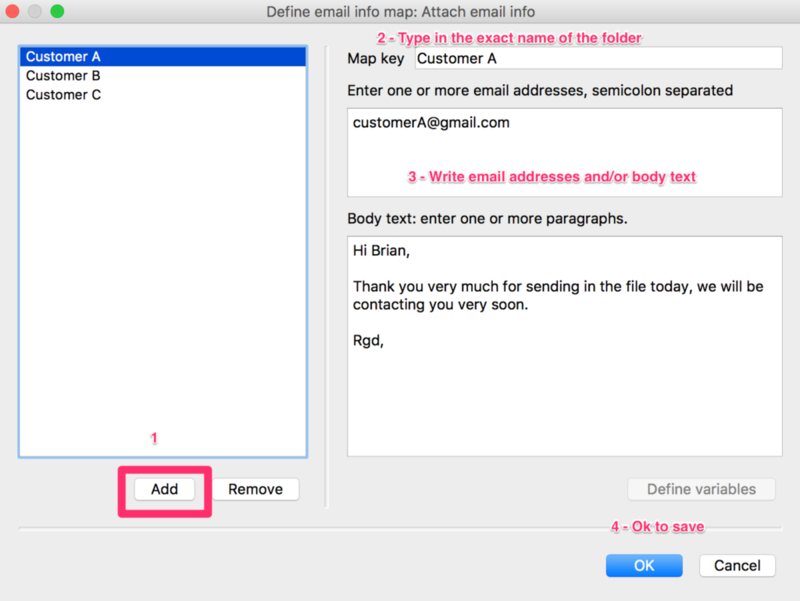 Now you are all set to send emails to customers automatically. The only thing you have to do is drop files into the folders. You will be saving a lot of time with this little setup. There’s no longer any need for you to check your emails, or to set up reminders. One thing checked off your daily task list, giving you time to focus on those real serious projects on your list! Please contact us today if you are interested in seeing a demo of Enfocus Switch or if you are interested in learning how your current workflow can be converted into an automatic one.